Sometimes, it can happen that the container does not start or stop as expected or you might have reasons to believe that CARGO is "acting weird". Here is a short list of things you can do to try debugging the problem. 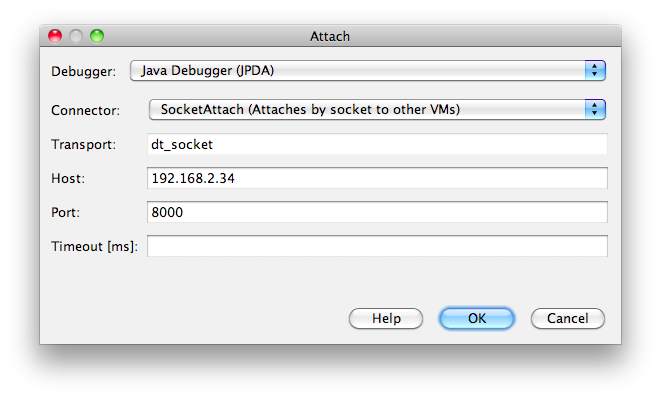 Most Java Virtual Machine implementations support remote debugging. Once started in debug mode, you can then remotely connect to your container using any IDE and debug your container and/or application. suspend is whether the launch of the container should first wait for a remote debugger to connect. If y, the container will wait for you to connect with your remote debugger before starting; if n the container will start immediately and at the same time listen on the remote debugging port. port is the port number to use for remote debugging. Steps for achieving the same in Eclipse IDE are similar. The JVM start arguments configuration property is rather recent (Codehaus CARGO 1.4.18 and onwards). The Container.setOutput(File) API allows you to redirect the container console (stdout) to a file. This is the first file you should check in case of problem. The generated log files will then be found in the working directory you have specified on the container (through the container.setWorkingDir() call). Use the container.setAppend(true|false) method to decide whether the log file is recreated or whether it is appended to, keeping the previous execution logs (by default, the file is recreated at every container start or stop). Use the append="true|false" attribute for controlling the log file creation behavior. On Maven2/Maven3, enabling Java debugger is done using the mvnDebug executable instead of mvn. Some Cargo classes support generation of logs. This is implemented through the notion of Logger and levels are managed using LogLevel. There are 3 levels defined in o.c.c.util.log.LogLevel: LogLevel.DEBUG, LogLevel.INFO and LogLevel.WARN (LogLevel.INFO is the default value). When using the Maven2/Maven3 plugin, CARGO will by default use the MavenLogger. When you use mvn with the -e option, both Maven itself and the CARGO plugin will log everything in debug mode.